We are a reputed firm, involved in manufacturing, exporting and supplying of Water Velocity Logger in the global market. The Water Velocity Logger that we deal in is a hand-held device and can be easily configured with computer and other devices. Available with us in several specifications, our Water Velocity Logger stands always high on performance parameters. 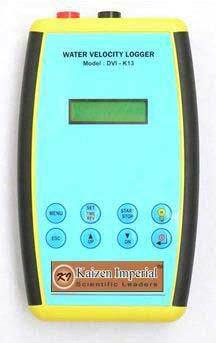 More about Water Velocity Logger : This is a small electronic hand-held device that can be used to measure flow velocity from mechanically rotating current meter. A superior feature of the DVI-K13 is its ability to store up-to five current meter data at a time and interface directly to a laptop, pocket PC, or other computing device and provide data in Ms- Excel file format that can be used externally to computer discharge.